It cannot be sufficiently stressed that the covenantal apologetic is first and foremost a Reformed apologetic. Consistently, a practitioner will be Confessional, therefore Covenantal and Calvinistic. These are sometimes called the “3 Cs.” This is not being stressed for a subjectivistic “purity’s” sake, nor for controversialism’s sake. It is being stressed for the sake of consistency. First and foremost in Reformed theology is the doctrine of the sufficiency of Scripture. From Scripture, we also have revealed the doctrine of God, and all of the other doctrines we believe and hold to. Consistent with these doctrines, we preach, and we defend the Gospel that we preach. While systematic theologies differ, somewhat – you will find, upon doing your own research into the matter, that the vast majority of such volumes are written by Reformed theologians. You will further note in your research that many, if not most of these volumes tend to follow the pattern of the confessions in their structure. There is often a Prolegomena, or “prefatory remarks” section, which deals with the structure of the following work, and discussing the methodology of the author in dealing with the subject. The initial paragraph above is a sort of prolegomena, for example. The Systematic itself begins with the doctrine of Scripture, followed by the doctrine of God, or theology proper. What should this tell us about the proper beginning for our apologetic? The Holy Scripture is the only sufficient, certain, and infallible rule of all saving knowledge, faith, and obedience, although the light of nature, and the works of creation and providence do so far manifest the goodness, wisdom, and power of God, as to leave men inexcusable; yet are they not sufficient to give that knowledge of God and his will which is necessary unto salvation. Notice first: The Scriptures alone are the sufficient, certain, and infallible rule of all saving knowledge, faith, and obedience. When we preach, we preach the Scripture, and the Scripture alone. When we defend the Gospel we preach, the same applies. When we, following the Scripture, and in accordance with its teaching, point to the light of nature, the works of creation and providence to show that they are without excuse, we cannot, and dare not stop there. To stop there is to stop short. We cannot only show the impossibility of their worldview, but we must confess and profess ours. We believe, of course, in Sola Scriptura – Scripture Alone. A necessary element of that doctrine, however, is “Tota Scriptura” – or, “all of Scripture.” It is from this doctrine that Systematic Theology arises. A truly systematic theology is one in which “… defense and positive statement go hand in hand.” Van Til adds later that “Systematic Theology is more closely related to apologetics than are any of the other disciplines. In it we have the system of truth that we are to defend.” I would hasten to add there that to Van Til, we proclaim the very things that we then defend. The exercise of Gospel proclamation is not only intertwined with its defense, but inextricable from it! What we are saying, in essence, is that our proclamation of the Gospel is as deeply, systematically, theological as is our defense of both the Gospel and the theology which gives rise to it. It is all connected, and must be connected. When we are engaged in apologetics, we are engaged in “the vindication of the Christian philosophy of life against the various forms of the non-Christian philosophy of life.” This will serve as our definition for apologetics, henceforth. It sets, in terms of entire life-and-world views, the two systems in antithesis (contrast, opposition). Note carefully what was just said. First, there is the (singular definite article) Christian philosophy of life, and there is the (singular definite article) non-Christian philosophy of life. As it is often expressed, there are two worldviews. Note, further, that there are “various forms” of the non-Christian philosophy of life, but there is one non-Christian philosophy of life. Note also that the same is not said about the Christian philosophy of life. Additionally, note the careful term which Van Til uses. It is the vindication of the Christian philosophy of life. It is the maintenance and defense of same. Much as the Gospel is just as much for the church as it is for the world, the “defense and confirmation of the gospel” has this dual focus. At this point, you may say “this is all very well in principle, but how do we practice this?” That is the next thing we will talk about. First, think back to what we’ve already said about systematic theology. What we believe is derived from the Scripture alone, and from the totality of Scripture. Such an organized, cohesive, and categorized system of belief is summarized in our confession of faith, then organized categorically in our systematic theology. The sum total of what we are to believe, as the “whole counsel of God”, is our “worldview.” It is the whole counsel of God which we present and preach – then likewise defend. Recall Van Til’s comment earlier – “defense and positive statement go hand in hand.” When we engage with an unbeliever, or even with a defective idea of Christianity, we first must understand the “totality picture” – the entire Christian worldview – and present it as a positive statement. I cannot stress this enough. Obviously, there will be time constraints you will be under. Very few conversations(!) you have will include uninterrupted stretches which allow you to present your entire system of theology, let alone your entire worldview. Bahnsen has told us that CVT used to say that we need to “buy the next cup of coffee.” This has a meaning on several levels, I believe. First, while we are to always be ready, we also need to “sanctify Christ as Lord in our hearts” in preparation for any defense we might give. We must be considerate of time constraints, be hospitable to our interlocutor, and be as willing to teach as we are willing to present our case. Paul speaks of the defense and confirmation of the Gospel in tandem. Peter’s “always be ready” is prefaced with an admonition to sanctity. In certain circles, it is sometimes said that we are not to study the Bible with the unbeliever. This, frankly, is a folly on par with that of the unbeliever! If the Gospel is the power of God to salvation, how are we then to proclaim if we don’t engage them by presenting them with the study and exegetical proclamation of the Word? It cannot be stressed enough that we must counter unbelief, in any guise, with the exegesis of Scripture. That brings us to an important point, however. When we make our “positive statement,” we aren’t doing so as “a possibility.” We are exegeting the Scripture, bringing out what it says, and by the authority it itself has. To present our worldview, we speak “as one who is speaking the utterances of God.” We are not doing so “autonomously”, or “according to ourselves”, but “theonomously” – as according to the Word of God. As God is a se, of Himself alone, the Scripture’s authority is a se. Think this over, if you would, given the next example. If the Scripture’s authority is of itself, if it ought to be believed, is truth itself, who are we to say that we shouldn’t study it with unbelievers? How can we say such a thing? If we are faithfully presenting the Scripture, we will do so in antithesis to the unbeliever’s conception of it. It will be antithetical to his conception of himself, the world, God Himself, and is, in fact, directly antithetical on every conceivable point of consideration. With that said, why on earth would we possibly say “I don’t do Bible studies with unbelievers”? At no point should we present any fact under discussion as “brute”, or “in common” with the unbeliever. At no point do we expect a “common ground” between us that isn’t taken directly from our worldview. As such, whether in confirmation or defense of the Gospel, we must, of necessity, study the Scripture with our audience. It is clearly presented in its own terms, and of its own authority, but that presentation must be made, and it must be expressed that our audience is expected to obey the precepts that we are privileged to unpack from it. This cannot be done without a positive expression of what we believe, and no defense of what we believe can be made unless we first express what it is we believe! Take, even, an example where the unbeliever objects to a misconception of our beliefs, before we have even expressed them. Is not the solution to this misconception as much a proper explanation of those beliefs as it is a rebuke of the misconception? It cannot do to simply say “you are wrong”, but fail to present what the Scripture actually teaches it, can it? If they persist in their misconception, we can surely address that. We can also address their inability to properly object to anything at all, according to their worldview – but we cannot be satisfied with simply stating that they are incorrect, can we? This, however, brings us to what, precisely, the Scripture teaches that we are to do. Obviously, we don’t expect unbelievers, as unbelievers, to properly deal with special revelation any better than they deal with general revelation. His revelation, of course, is perspicuous in either case. We know that all men know God – we must not, however, be content to leave it at that; because while it is true that all men are without excuse, they are also without God, and without hope in this world. Since this is so, it is not enough to merely state that they know God. It is not even enough to present the “bare” gospel, devoid of its context in revelation. The Gospel is rooted in (and withers apart from) the bedrock of Scripture. Mere quotation, devoid of exegesis, is a shallow soil. When we are given the apologetic injunction, as we have already mentioned, it follows an injunction to sanctity. But sanctify Christ as Lord in your hearts. This follows from Peter’s discussion prior, where he is speaking of our interaction with the world. When we give reply, when we give an answer, it is for what? The hope within us – and that reply, that answer, is to be conducted with gentleness toward men, and reverence toward God. We do, indeed, know that all men know God. We also know that apart from His work, they are without hope. Our possession of hope should drive us to gentleness of spirit, and reverence for the Lord whom we are set apart to. With those admonitions in mind, what, then, are we to do? Firstly, stress in your own mind that the primary goal is to vindicate Christianity as a unit against not-Christianity, as a unit. When we say “as a unit”, we mean “as a cohesive, unified whole.” Obviously, the eventual result of the exercise is going to be the demonstration of not-Christianity as anything but cohesive, unified and complete. On the other hand, we also must ensure, to the best of our ability, that what we are interacting with is the best attempt that the unbeliever can make at such a thing. We want to address the best that they have to offer. Part of “buying the next cup of coffee” is preparation and consideration – but the other part of the equation is that we have to always be ready to further the conversation. We have to maintain and develop not only our own system, but gently direct our interlocutor toward as full an expression of his own beliefs as is possible. When you offer to buy the next cup, you show not only a prepared willingness, but a consideration of the other person. By furthering the conversation, you are also showing that you care about the other person enough to “help” them. See, when we get to the “transcendental” argument, we are going to do two things. First, we are going to “step inside” their system, for the sake of argument. Using their own system, we examine it for internal coherency – consistency. Is it able, of itself, to account for its own claims? The claims in question will vary, according to the “form” of not-Christianity it takes. We take what they give us, and using what they give us, make an internal critique of both the presuppositional commitments that give rise to it, and of the individual claims which are made in the course of its explanation. As such, it has to be accurate, and as complete as we can manage. That is often going to involve asking questions for clarification, not just simply to further our subsequent critique. Remember, we are supposed to be consistent. If we expect them to ask clarifying questions, and not just use “questions” to trap us, we have to do the same for them. Leaving yourself open to a charge of inconsistency is not a good idea. This is also important on another level. The next thing we do is invite them to take the same sort of step – but this time, into our own system. This requires, of course, that your own system be presented. It also requires that we explain it as well as we can, and be willing to answer questions. That doesn’t excuse us from presenting something significantly more robust than a “minimal facts” about Christianity, because we want them to understand what we are telling them, right? It often takes some work to get others to understand our position. After all, we would require that our interlocutor then represent Christianity accurately, and as completely as they can manage when attempting their internal critique, right? The impossibility of the contrary – the focus of the transcendental argument’s force – results when it is demonstrated, from their own system, that according to that system, they cannot account for the claims they themselves consider to be important, and have themselves made. The contrast is made between the consistency of the two worldviews, the ability or lack thereof to account for their own claims. This cannot be completed – the job is not “finished” unless there is a contrast to be seen. This can only be the case when both worldviews are presented, both worldviews are examined, and both worldviews are compared – compared indirectly, and compared as entire worldviews. When the impossibility of the contrary is properly demonstrated, it is not only shown that ~CT cannot account for it’s own claims, but that it cannot affirm, deny, or contrast anything at all. When this is demonstrated – it is only demonstrated because they have “stood inside” your own worldview, and seen how he has to “borrow” from it to make his argument – and then “argue” against the very thing he just borrowed from. This isn’t possible for them to grasp until they step inside themselves. Keep in mind on this point, however, that this is depicting an outcome where they are granted “eyes to see, and ears to hear.” When most unbelievers take up our invitation, they are going to take that cup of coffee, and pour it into the nearest potted plant. Sometimes, it must be said, we also take our fresh cups of coffee and pour them into our respective nearby potted plant! We do this when we fail to adequately and accurately represent their position during our critique. They do so in the same way. Instead of engaging in an internal critique, they engage in an external critique. They don’t “step inside” our worldview – they remain “standing in” their own, and critique our positions as if we had the sort of “common ground” that we deny. What do we need to express, when it comes to our own worldview? As a practical matter, I would suggest preparing, in advance, summaries of various lengths. You might have 5 minutes, 20 minutes, or an hour. It is crucial to be ready. What we are to be ready to do, on our own part, is to present as succinct a summarization of CT as we can manage within the time we have. This is also important, because much of our time is going to be spent helping the unbeliever to formulate their own. A smattering of belief systems have something akin to our systematic, but most tend not to. Part of why we should be so careful to succinctly and accurately lay out our own worldview is that we are intentionally providing a model for our opponents. I also find it helpful to ask “how much time do you think we have for this conversation?” That way, you can mentally “gear up” for a particular time limit, and disengage gracefully. As you close, you can ask how they would like you to follow up, as well. The point, after all, is not to have a one-time “experience” – but a meaningful, helpful discussion over time. We should close this with an important point. The general outline I’ve given is intended to apply not solely to atheists, but to any stripe of unbelievers. Unfortunately, the vast majority of presuppositional/covenantal apologetic work to date is centered on answering atheism, specifically. I would exhort you to leave that comfort zone. Many, of course, have done excellent work in dealing with Jehovah’s Witnesses, Mormons, Roman Catholics, Muslims, and others – and I commend those endeavors highly. Comparatively, however, this work is thin on the ground. It behooves us all to have an answer for whoever asks. What does not behoove us is to have the same answer for whoever asks, in one sense. In another sense, we have the same faith, no matter who asks us – but the particular issues involved with responding to specific groups are going to vary widely. Be prepared to deal with what they give you. Study broadly. Van Til likens our task to that of a scout, in the military. We have to have a basic understanding of the entire battlefield, and the various weapons and units which populate it. In effect, we should be able to “man the parapets” anywhere, as needed. We are, in a very real sense, generalists. The same scope that systematic theology covers is the same scope that we must be prepared to engage in, as apologists. That doesn’t mean we have to eschew specialization at all costs – but it does mean that we have to have an appreciation of the issues faced along the entire front, as best we can. To retain a proper balance, we have to be able to understand the interplay of the entirety of the doctrines we confess. When we do so, we are less prone to leave our flanks vulnerable to other attacks. Again, this isn’t to denigrate the specialists in particular fields – but to note that as generalists, we have to be familiar with the various specialties, in order to use their talents and conclusions properly. This, of course, take time and effort. Don’t be discouraged. Dive in! Begin with systematic theology, then delve deeply into the work of specialists in the various disciplines of theological study. You won’t be disappointed. THIS IS SO GOOD!! I’ve been trying to tell some people how this method is applied and how it is Biblical when done as a whole, not just half of the method. This is a great summary – to the point but explanatory. 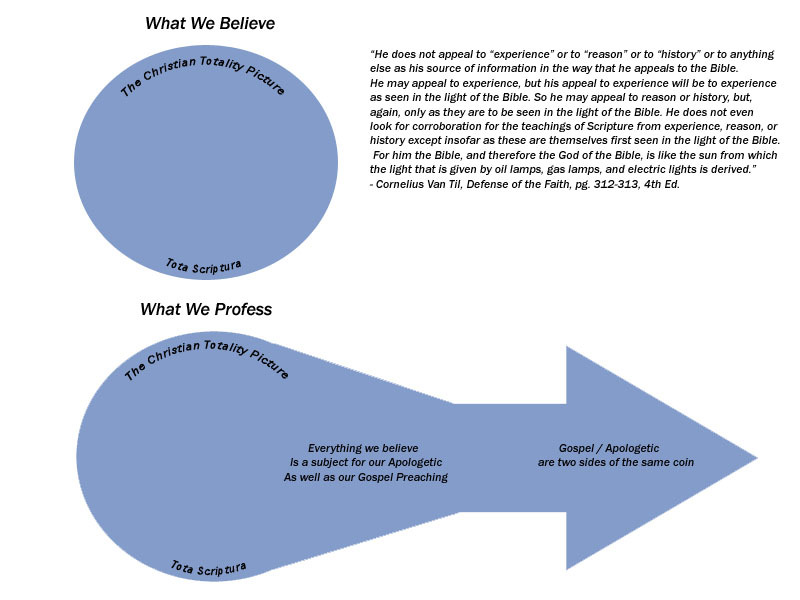 I intend to show this to some people to help them understand the use of Scripture in apologetics as we defend the Gospel! Thanks RK!! I think this is your best post so far. Broad-style introductions to apologetics are very helpful.